Denise Rathbun went to the laundromat one day in Wichita on November 26, 1977, pushing a load of laundry in a baby carriage. It started to rain that evening and perhaps she accepted an offer of a ride home. On December 10, 1977 she was found dead in a frozen creek, the baby carriage tossed nearby. 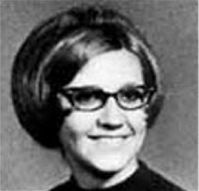 Nancy Fox was murdered by BTK, Dennis Rader, in the night of December 8-9, 1977. At 8:20 am on December 9, police received a phone call from BTK alerting them of the murder. Denise Rathbun was found in the creek the next day by a person out walking. Could this have been a sort of BTK double-header? Was the murder of Denise unsatisfactory in some way, that he had to search out another victim in the form of Nancy? The case of Denise Rathbun has never been solved. By a very strange coincidence, her two young children were named Bryan, 3, and Kerri, 1. Dennis Rader at that time had a son named Brian, 2, and his wife was pregnant with their daughter who was later named Kerri. Wichita police fear that a 26-year-old mother who disappeared Saturday while out to dry her laundry may have fallen victim to foul play. Capt. Troy Hampton said the missing person, Denise M. Rathbun, 26, of 5332 E. Pine, left her home between 3 p.m. and 8:30 p.m. Saturday, pushing a baby carriage full of wet laundry. The woman, mother of two small children, was headed for a laundromat at 532 N. Edgemoor, about two blocks away. She did not return. Hampton said indications were that she would not have run away from her family. He said interviews with her minister, family and friends here and out of state indicated that she had not been having marital problems, was very religious and was dedicated to her children (names and ages omitted by Spud). He said she had no prior mental problems or problems with drugs or alcohol. 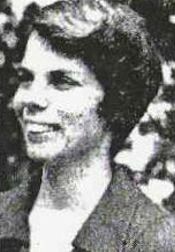 Hampton noted that the area in which she disappeared is one block from where four members of the Joseph Otero family were strangled on Jan. 15, 1974. He said the police were very aware of the coincidence. Hampton said the Rathbuns had visited her husbands parents Saturday and returned home for supper. Hampton said the children apparently bothered her while she was preparing supper, but her husband said he did not think that would have motivated her to leave home. After supper, her husband, Kenneth, who was feeling ill, remained home with the children while she went to the laundry. When she did not return home, her husband and mother-in-law went to the Laundromat, where they found a pair of underwear the same size and brand as (the Rathbuns son - name omitted by Spud) in a dryer. They searched the surrounding area but failed to find Mrs. Rathbun, the baby carriage, laundry, purse or any other sign of her. Hampton said she had about $100 in her purse at the time, but a check of cab companies, airlines and the bus depot failed to turn up any trace of her. She does not drive, Hampton said, and is considered unlikely to have hitchhiked. Hampton said police wondered whether she might have accepted a ride from someone at the laundry because it was cold and rainy Saturday night. He said her husband said they had discussed a similar situation some time ago and she said she would never hitchhike because it was too dangerous. Hampton said the owner of the Laundromat went there about 9 p.m. Saturday and saw only one person, a man who is a regular Saturday night customer. That mans identity is unknown, Hampton said, but police would like to talk to him to determine whether he saw Mrs. Rathbun and whether he saw anyone else. Mrs. Rathbun is 5-feet-4, weighs 110 pounds and has shoulder-length brown hair. When she left home she was wearing a green corduroy coat, green pants and tan shoes with three-inch heels. She was carrying a brown purse with a strap and three zippered compartments. The baby carriage was chrome with blue and white vinyl. The carriage was loaded with a white plastic clothes basket and laundry, mostly diapers. Hampton said the Rathbuns were about to leave Wichita because her husband was to be transferred by the Air Force to Italy for one year. Mrs. Rathbun and the children were going to move to Florida to live with her mother. The body of Denise Rathbun, a 26-year-old mother of two missing from Wichita since Nov. 26, was found Sunday in a creek just north of the Sedgwick-Harvey county line. Her body was found about 4 p.m. Sunday by a hunter walking along 133rd Street North between Hydraulic and Hillside. The body was found partially beneath the small bridge spanning the creek and her legs were frozen in the water. Also in the water were the baby carriage and laundry that Mrs. Rathbun had taken to a laundromat at Central and Edgemoor the night she disappeared. Wichita Police Lt. Col. Bill Cornwell said there was no indication of how she died or how long she had been dead. However, he said, police are proceeding on the assumption that her death was a homicide. While detectives and laboratory investigators combed the area near the body Sunday evening, other officers in Wichita were searching for two men wanted for questioning about the death. Cornwell said one of the men had been questioned previously. After officers chopped ice away from Mrs. Rathbuns body and removed it from the creek, he said, the coroner found no wounds or marks to indicate how the woman had died. Because her body was frozen, an autopsy will not be performed until today, Cornwell said. There were no indications Mrs. Rathbun had been sexually assaulted, and the body was fully clothed, he said. Officers said it appeared that the body had been dumped over the rail of the bridge. The location of the body was such that it would not be seen unless someone had looked straight down from the bridge, police said. Mrs. Rathbun was last reported seen by her husband, Kenneth, about 8 p.m. Nov. 26 when she left her home at 5332 E Pine pushing a baby carriage loaded with wet clothes to be dried at the laundromat. The owner of the laundromat told police that he saw a regular male customer in the laundry when he went there about 9 p.m. that night. Police have since been looking for that man, but Cornwell said Sunday that he was not one of the two suspects police were seeking. Police also are looking for a Ford Mustang with an out-of-state license plate and primer spots on the body. The car was seen at the laundromat about 7:30 p.m. Nov. 26. Capt. Troy Hampton has said that Mrs. Rathbun may have accepted a ride home from someone she knew because it was raining that night. When she did not return home Nov. 26, her husband and his mother said they searched for her and found underwear, like what her son wore, in a dryer at the laundry. Kenneth Rathbun and several other persons have since passed polygraph examinations to determine whether they were involved in her disappearance, police said. Mrs. Rathbun had about $100 in her purse when she disappeared, and her purse has not been found near the creek, Cornwell said. The Rathbuns were preparing to leave Wichita Dec. 15. The husband, an Air Force medical technician at McConnell Air Force Base, was scheduled to leave for a 10-month tour of duty in Italy. Mrs. Rathbun and the children (names and ages omitted by Spud) were going to live with her mother in Miami. Officers requested that anyone who has seen any activity near the creek since Mrs. Rathbuns disappearance contact the investigations section of the Wichita Police Department. By another strange coincidence, the laundromat where Denise was last seen was on the same street and one block away from the scene of the grisly Otero family murders by BTK in 1974.